These are the options presented to the College today for style directions for the redesigned Web site. Here are the explanations of each concept given by the contractor. This direction is based on a student’s dorm room wall/door. 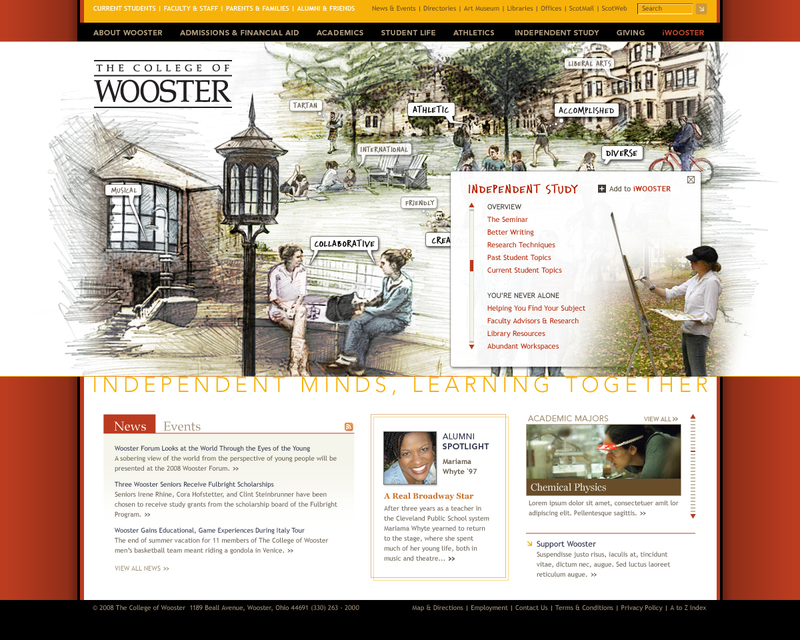 We call this “eclectic” because it is composed of elements drawn from various sources to tell the story of “who Wooster is.” This layout creates a visual aesthetic that is student-centric where the unique objects and elements tell the story of what it feels like to be at Wooster. 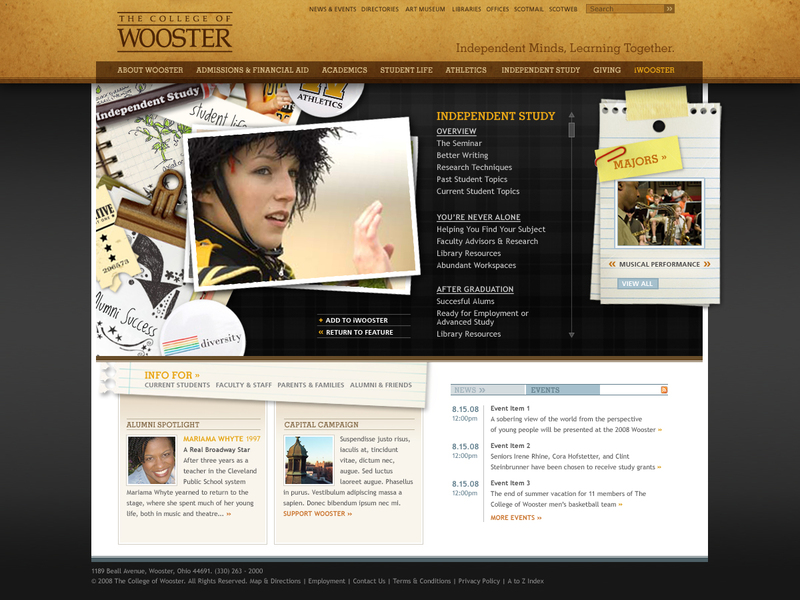 While there is no “typical” student at Wooster, it begins to show the various levels of interests, activities and involvement of students at the college. The dorm wall/door “Wooster Is” feature is built in Flash and invites the user to interact and explore but is not overwhelming. 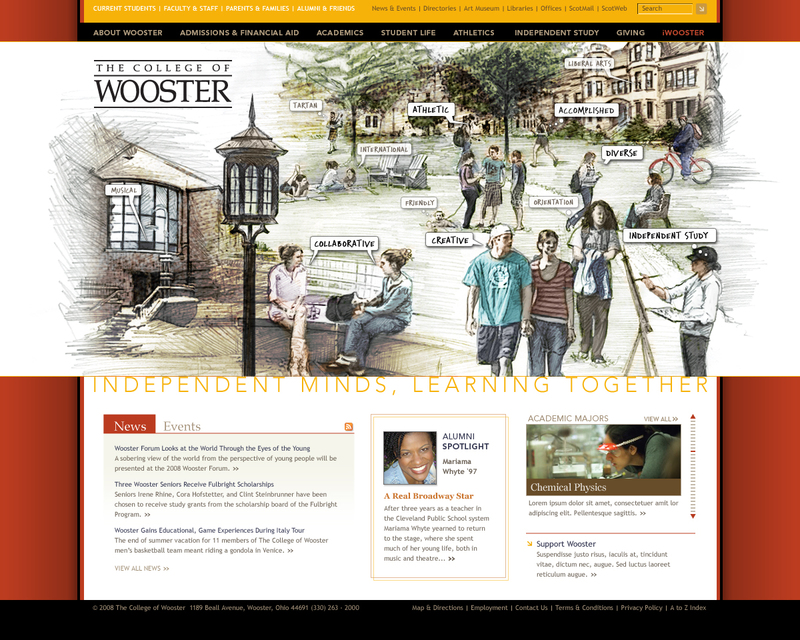 Clicking on a minor keyword in the “Wooster Is” feature will reveal information relevant to that word and will link to that area on the site. There is also a prompt to add this to your “iWooster.” Minor keywords will change periodically, while major keywords stay the same although the imagery and objects can swap out on unique session. When mousing over major keyword, the items will activate and move, grow or shake. Clicking on a major keyword will cause the items to shuffle to the side and the feature presents all the associated links to that keyword. This design is a walking tour of Wooster where the visual elements each tell a story. Clicking on a minor keyword in the “Wooster Is” Flash feature will reveal information relevant to that word and will turn from sketch to photo and ideally activate a video component. There is also a prompt to add this to your “iWooster.” Minor keywords will change periodically, while major keywords stay the same although the imagery and objects can swap out on unique session. When mousing over on a major keyword, the sketch turns to real photography and activates the video. A click will reveal the associated links. The dark color palette of the stylized campus it meant to act as the stage to the activity within the “Wooster Is” feature. The imagery of the major keywords is meant to take center stage and tell it’s unique story. Clicking on a minor keyword in the “Wooster Is” Flash feature will reveal information relevant to that word. Minor keywords will change periodically, while major keywords stay the same. When mousing over on a major keyword, the silhouette is revealed. A click will reveal the associated links and imagery related to the keyword. I’m going to talk about each and try to highlight what I see as the strengths and weaknesses. Stregths: I think this design is visually interesting and captures what I remember of my time at Wooster. When I look at it I get a good vibe and I think students looking at Wooster will get that vibe as well. The desktop/cork board design is something I think students will get. The colors feel warm and inviting and serve to add more punch to the images. Weaknesses: The text color in the navigation bars and header seems to blend in with the background color making the text hard to read. The branding statement seems to get lost on the page, but I do think the imagery reflects the message. The fact that the Wooster IS area is Flash may mean it is harder for us to maintain and update. Strengths: This design clearly highlights the message, academic programs, news and events, and profile. The design is also very different from what one finds at other schools. It really represents the communal aspect of campus life, but it takes a while to see it. Weaknesses: The image feels cartoonish and reminds me of Norman Rockwell. The cartoonish aspect has been a criticism of our current print materials. I do not think students will feel that this gives a good sense of what Wooster is like. The image as it stands also does not reflect any single place on campus, but is a montage of several places. 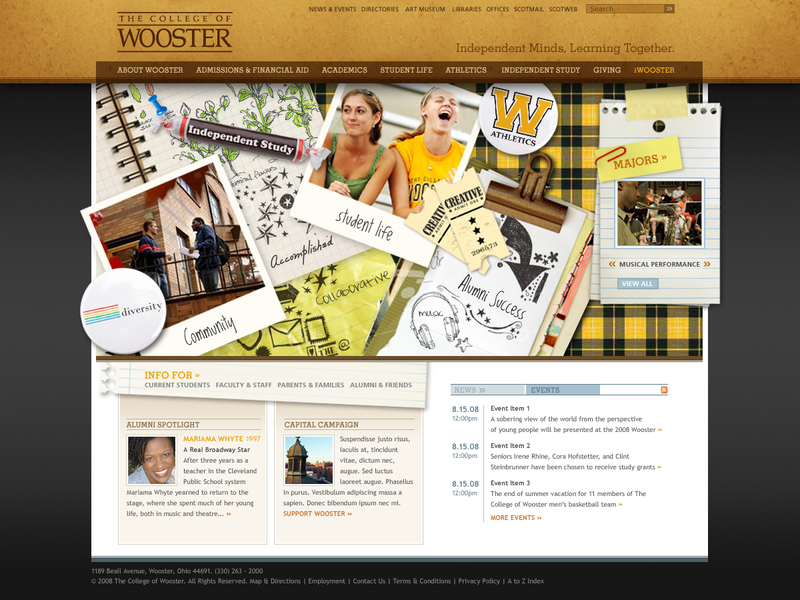 It also is not featuring Kauke which many alums see as the symbol of Wooster. The nature of the image could make maintenance an issue if we want to update or change the image. Strengths: This design is clearly not like any other college Web site. It will be a memorable site and is very interesting visually.The design features Kauke and gives real pop to the major keyword areas when clicked. Weaknesses: This design is clearly not like any other college Web site. The message is almost impossible to find and I don’t think the design communicates the message as well as the other two designs. 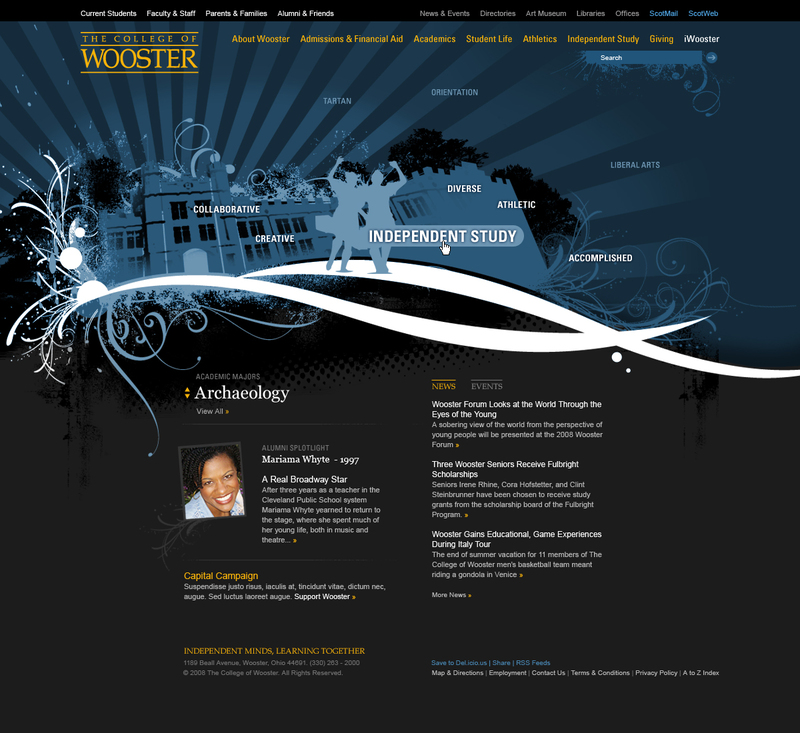 I’m not sure the design will appeal to the type of student we have identified as a good fit for Wooster. I think alums will really find this site hard to see as their Wooster. What do you think? Are there strengths I missed in any of the designs? Are there weaknesses I’ve overlooked? Keep in mind that these are directions and that specific elements of each design can be massaged and tweaked. We need to decide which concept best communicates who Wooster is and will be. The design firm gave us the following questions to think about as we look at each design and I encourage you to address them in your comments. Where does your eye land first on the page? What four or five words would you use to describe this page? What actions do you think you might take coming to the page? Does this feel like Wooster to you? Why or why not? Do you think you could find any information you are seeking from this page? Do the colors and images resonate with you? Why or why not? Do you think prospective students would respond to this design? Why or why not? Do you think alumni would respond to the design? Why or why not? Thanks for posting these Jon. I’ll try to address the questions the design team posed (partly, anyway). Since the navigation elements are larger in the first design, my eye is drawn to them more directly than it is in the other two. This is nice for prospective students. 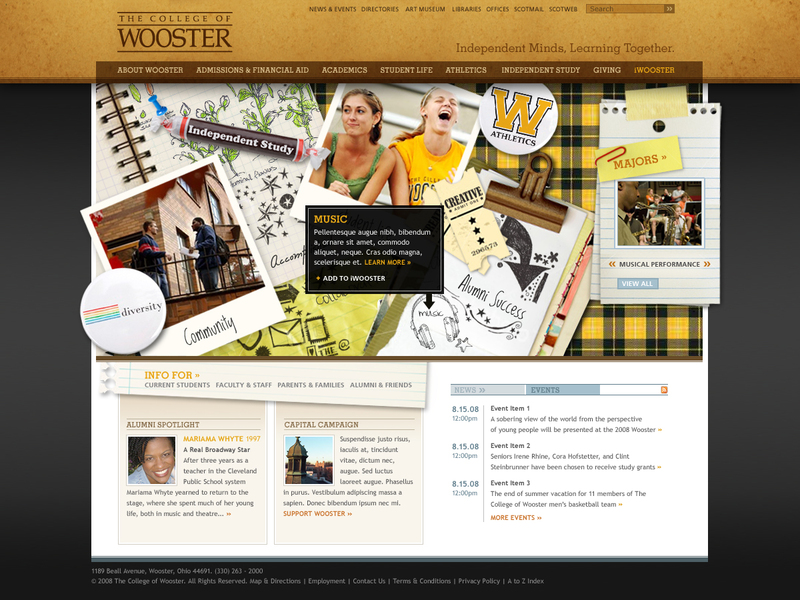 While the first design does feel like Wooster to me, it also feels like other college/university websites I’ve visited. The navigation is novel, but the look is maybe a little too familiar. The second design is…different. I don’t know that I like the sketched image look. It feels like some generic caricature of college students. My eye is drawn to the thought/speech bubbles. This is nice for prospective student navigation. The third design is quite different. My immediate reaction was negative but I actually think it could be very striking with some work on the color and design. If the image of Kauke and the nav links stood out a little more and the upper background was a little different, this could be a very unique, interesting and easily navigable home page. It’s definitely not like any other college/university home page that I have seen. If Kauke stood out a little more and the background brought in some other element from Wooster it would “feel” more like Wooster to me. There are close to 40 links on the home page, which seems like a lot. Some of the links seem redundant as well. I could find the info I’m looking for from this page but it might take some trial and error or a few minutes sorting through links. It sounds like all three will have flash actions and animations associated with them. Depending on how these work, they could be annoying when simply trying to find the right link. I’d be interested to see how they look. This is my clear first choice. 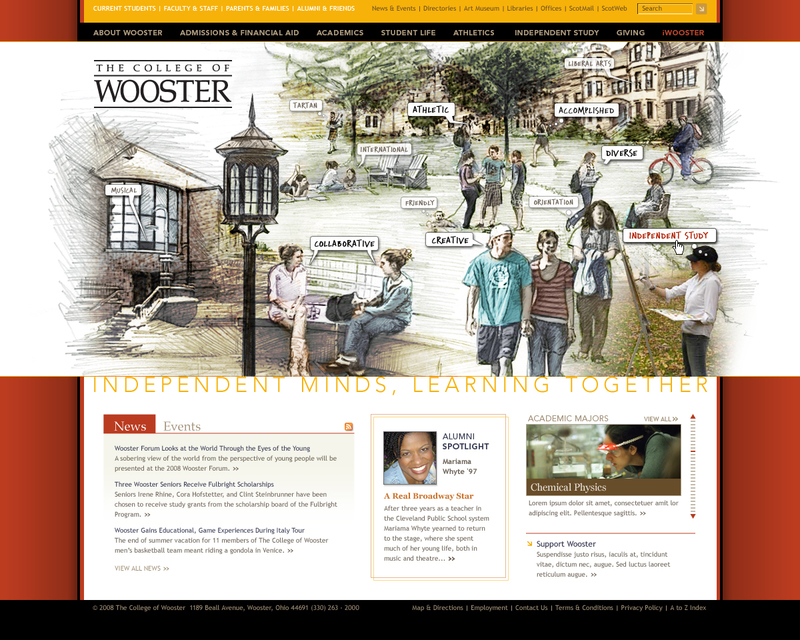 It is student-centered, showing elements of a *student’s* life that can expand to tell Wooster’s story from the perspective of a student. Where does your eye land first on the page? center – the student life photo. Do you think alumni would respond to the design? Why or why not? I think so; should bring back memories. Not as cool or interesting as Eclectic. I look at this and think it is an “adult’s” view of the College. Is this how student’s see the College? I don’t care for the font for the text or the use of sketches instead of photos. This gives me a sense of being removed from the actual College – a rendering of the College instead of actual images. Too detached. Does this feel like Wooster to you? Why or why not? 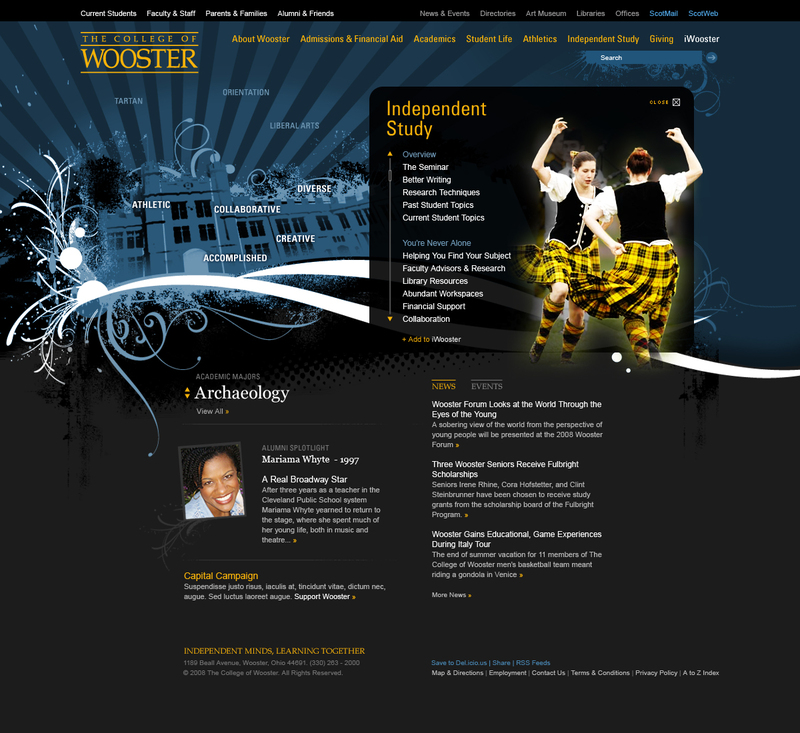 Well, it captures some aspects of Wooster; I see a lot of white people; where is the academics? Do you think you could find any information you are seeking from this page? I don’t know; how did you decide on these keywords? Do the colors and images resonate with you? Why or why not? No, don’t care for the drawings; it all looks fuzzy, not in focus, not quite real. Do you think alumni would respond to the design? Why or why not? they might; some might think we have “progressed” and others might think we have lost a sense of tradition. Um…is this Hogwarts? or Kauke? Don’t like this at all. Looks really contrived and doesn’t give anything like an accurate picture of the College, and I think it is critical that the page do that. Does this feel like Wooster to you? Why or why not? Absolutely not. Kauke is a landmark on campus and it doesn’t look like this; the college culture doesn’t begin to match this image; is this a day for night shot? Do you think you could find any information you are seeking from this page? probably; is there significance to the fact that some keywords stand out more than others. Do the colors and images resonate with you? Why or why not? No, pretty clear from the above I don’t care for this. Do you think prospective students would respond to this design? Why or why not? Don’t know; but I am sure that if they look at this, then visit campus, they’ll wonder about the connection. This is NOT an image I can imagine will make students more interested in visiting campus. Do you think alumni would respond to the design? Why or why not? Not likely. Do you think this is how they remember or think of Wooster? Kauke? First, I think all the designs are too heavily geared towards prospective students. It would be nice to have more audiences served in the primary focus area of the home page design. As an alum, I would visit my alma mater’s home page to see updates about what is coming to campus, how faculty are engaged in teaching and research, what innovative things students are doing, etc.. To do this effectively, I think the home page emphasis, or primary design element should be frequently updated/changing — something to keep me coming back. I know this often manifests in the flash slide show of “stories” idea that is practically a college home page cliché now days, but hey, it must mean it is effective at some level. I see in all the draft designs that there is a mostly text-based effort at spotlighting news and events but always in an out of the way place and almost as an after-thought. As to the specific proposed designs, the first two are tenable, the last one (the one Jon calls “stylized”) is probably too far out there for most people. Prospective students (the 16-18 year olds) may be OK with it. Too abstract. The one dubbed “eclectic” bothers me from design perspective. The reproduction of physical world organizational tools and media for web content like paper clips, notepad pages, metal clamps (do students even use those? ), and Polaroid pictures (ahem: http://tinyurl.com/3jmz38) just seems contrived. Trying too hard to be cute. The “classic design:” Again, get some dynamic content somewhere in the top two-thirds of the page. The sketch, to me, is a non-starter. Wooster has a beautiful campus with which people have tangible connections. The web is a fantastic image delivery medium. Show real pictures. From all of the descriptive “Wooster phrasing” (collaborative, creative, diverse, accomplished, etc..), it looks like someone conducted a focus group in the community to identify “what Wooster is.” I co-chaired a process like that when I worked at Washington & Jefferson College and, guess what, we came up with a pretty similar list because it is a pretty similar institution. I bet many liberal arts colleges would come up with a nearly identical list. A lot of the phrases, of course, go right along with what many people at these types of institutions hold as ideal. But what *differentiates* Wooster from these others? Well, the big one in my mind is Independent Study. Yeah, IS is there in the phrase collage but it is diluted by all of the small residential college clichés. Run with IS. Also, some of the phrasing in some of the designs is pretty borderline touchy-feely. For example, “you’re never alone,” “abundant workspaces,” and even “orientation” (why does this get front page real-estate at all?). This type of stuff is fine for down-level pages but the home page? I like the “Independent Minds, Learning Together” motto. Nice balance. An institution’s home page should project some (at least minor) level of gravitas. It doesn’t have to be all “college is serious business,” or anything, but the liberal arts tradition is an honored one that, at its best, produces deep thinkers, lifelong learners, and instills a desire to serve the greater good. And even for prospective students, there should be some clue that they will be entering a community that, in addition to the other stuff, also values rigorous scholarship, critical thinking, quantitative analysis, etc..That all being said, the status quo must change. What is up now is in dire need of a refresh. I tend to agree with Simon on the order of preference. The “Eclectic” design is student-oriented, yet functional and appealing to alumni. The “Classic” is too cartoon-like, and the blurbs of text scattered across the scene seem too chaotic. The “Sylized” looks more appropriate for an art school or very edgy, countercultural type of institution than for a midwestern liberal arts college that has stood the test of time. Please send your consultant back to the drawing board, or else hand the task over to some in-house folks – maybe even some talented students, hmm?All three designs are cluttered and far too busy. “Chaotic” is the first word that pops into my mind, followed by some less charitable words. And please, please don’t forget that not everyone has a high-speed connection suitable for silly Flash animations.If I absolutely HAD to chose one, I’d pick the Eclectic design, but only under extreme duress. The Stylized design is horrible – it looks like a really bad MySpace page on toxic mushrooms. The Classic scheme is decent, but the sketches would better be used to promote an art school – they’re extremely generic, as someone commented above. And by tossing out the photos, you lose a greatÂ opportunity to showcase a beautiful campus through the talents of Matt Dilyard, who is a fantastic photographer.I noticed a comment in the Voice story on this topic about networking. Please, PLEASE don’t devote time or resources to developing a WooSpace or FaceCOW system. Students and a large portion of alumni already use Facebook and MySpace, plus WordPress and Blogger. Don’t reinvent the wheel for something that will be a huge flop.There is nothing wrong with the current site – it’s easy to navigate and find the information you need. If the problem is on the back-end, with posting information and updates, consider enhancements there, but don’t throw the baby out with the bathwater.